We are now on YouTube! Check out our dedicated EYFS Tracker community hub. It is an excellent resource if you are just getting started or need an EYFS Tracker refresher. Don’t forget to direct new starters to the training videos too. Keep an eye out for further tips and updates demonstrating how to get the most out of your Tracker. Watch, Like and Subscribe Today. In anticipation of the new General Data Protection Regulation (GDPR) law coming into force on 25th May 2018, we’d like to assure you that we are fully compliant. GDPR replaces the existing Data Protection Act. We have improved the look of the learning journey reports so that they are easier to read. The changes are slight but each aspect is now separated and better aligned with the date achieved. The report is visually more attractive. It now uses bold colours to highlight headings and make it more professional looking. These pictures give you an idea of the new look. You can now also export the learning journey to a Microsoft Word document. Users told us that they wanted to be able to edit the learning journey before sending it to parents. This can now be done in Word. You can still export the learning journey straight into PDF if you prefer. For your 2016/17 learning journeys these changes are optional so you can still use the old version and method if you would prefer. We hope you like the new look and functionality. If you have any suggestions for how we can develop this feature further, please do get in touch! As you may have noticed, as of today the EYFS Tracker has a brand new design which the team has been working hard on over the last few months. The features of the system are the same as before, and everything is in the same place, but the site should feel fresher and easier to navigate, particularly for new users. In particular, the icons at the end of the rows in the My Children and Results section have been amended, with easier access to the Next Steps and Characteristics of Effective Learning screens. We hope you enjoy the new design – let us know if you have any feedback. The EYFS Tracker service is now hosted by UK Servers who have been providing mission critical dedicated servers within the UK and Europe since 2004. They have a secure data centre in Coventry and store backups in the EU. The new company hosts over 4,000 servers for customers ranging from small business to multinational corporations. We are confident that the new providers are well established and their technology and processes are robust, ensuring that your data remains safe. The EYFS Tracker itself remains exactly the same and there in no difference in how you can use it but please do get in touch if you have any questions or concerns. There is now a way to store information on the Characteristics of Effective Learning. 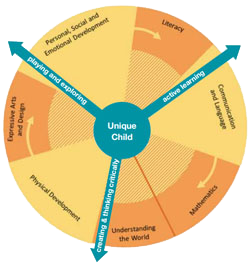 These are the ways in which a child engages with other people and their environment – playing and exploring, active learning, and creating and thinking critically. They underpin learning and development across all areas and support the child to remain an effective and motivated learner. From either the My Children or Results sections, click on the notepad icon to enter free text for the child’s characteristics. If you have any suggestions for how we can develop this feature further, please do get in touch! Spell Checker: We have added a spell checker to text boxes such as those in the Next Steps and Characteristics of Effective Learning sections. This will help produce accurate Learning Journeys in an easier way. Child Counter: At the top of the Results section there is now a box that counts the number of children currently being displayed in the list. This is useful to ensure that you aren’t missing any children or have children that should not be in the list. We have implemented a feature to allow you to record the 'Next Steps' for each of your children. From either the My Children or Results sections, click on the notepad icon to enter free text for the child’s next steps. If you have a child who leaves and then 're-joins' your setting you can 'reinstate' them yourself by clicking on the 'cross' mark on the end of the relevant row in the 'My Children' section. There is a 'Reinstate Child' button on this menu. FSP Return - You can choose how to treat 'L' within the 'EL Goals' category allowing you more flexibility in the way this data is returned. If you find any of your evidence images are showing the wrong way up, you can now rotate them in the tracker. Click the 'rotate image' button within the evidence section to get started. You can also now choose to display larger images in the learning journey, via an optional setting. We've been working hard on some great new features for the new year and are pleased to announce that they are now available for all to use. You can now import children into the Tracker using our handy template spreadsheet, as well as via the existing 'CTF' option. Click the button in the 'My Children' section to get started. Forgotten your password? You can now reset it yourself. Can't remember which report you ran last time? You'll find the reference codes and date run are now printed in the footer. Also note that when you move children 'up' an ageband in the results section, the High/Medium/Low indicator will automatically be reset to Medium. These additions were made as a direct result of feedback and requests by members of our user community, so if you have any questions or suggestions for further enhancements please do get in touch! We're pleased to announce that we've released another great report on Age Related Expectations! This one, labelled S7 in the Summary Reports section, shows you in one place what proportion of your children are at or above age related expectations across all 17 aspects. There is a handy graph to help you understand where additional support may be required in your setting. The usual range of advanced extra filters are available to allow you to further understand the performance of specific cohorts. This report was a built as a direct result of feedback and requests by members of our user community, so if you have any questions or suggestions for further enhancements please do get in touch! We are excited to announce that you now have the option to track your children 6 times a year in the EYFS Tracker. The time points are called Autumn 1, Autumn 2, Spring 1, Spring 2, Summer 1 and Summer 2. As well as users that wish to track twice per term, this feature should be particularly useful for settings that have children joining throughout the year as it provides more time points for you to include an "on entry" assessment. 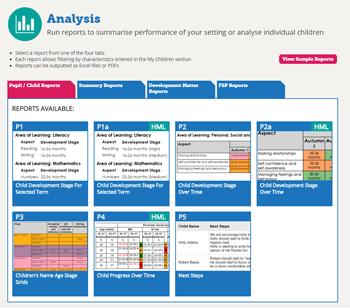 The same great range of reports are available for schools and settings using the 6 time point option. New users can select the 6 time point option when starting their free trial. Existing users can edit their settings in My Account, by clicking Edit Details. As ever, please get in touch if you have any questions or suggestions for further enhancements. Note that practitioners are still encouraged to supplement the analysis with their own judgements of the progress of their children and the report provides a separate table for you to fill in. We've taken on board recent feedback from our users and added the facility to upload your own logo to the Tracker which can then be used to personalise your Learning Journey reports with a cover page. Get started by uploading your logo in the section (click 'edit details'). We've also improved the appearance of the Learning Journey reports at the same time. In the 'evidence' section you can distinguish those outcomes for which you have uploaded photos to, from those which have notes or those which have both! As ever, please get in touch if you have any questions or comments. We will be exhibiting at the Childcare Expo in London at Kensington Olympia on the 28th and 29th of March. It is a free event for anyone working in the Early Years and Childcare Sector. We are offering FREE one to one training for existing users and any new users that sign up at the event as well as sign-up discounts and more. It is set to be an exciting two days with loads on offer so please come and see us if you are planning on being there! We've updated references to 'pupils' throughout the EYFS Tracker with the word 'children' instead, which better reflects the way that the Tracker is used in a diverse range of Early Years Settings. We've also amended the 'Pupil Reports' section so it is now titled 'Learning Journey'. You should notice no other differences in functionality but please do get in touch if you have any questions or comments. We've created a new 'getting started' guide to help you get up and running quickly with the Tracker. It could also be used to help any new users you may have understand the basics quickly. Click the button to download! New EYFS Tracker Design Launched! We've refreshed the homepage and menu bar design for the EYFS Tracker but, don't worry, it's still the same Tracker underneath after you have logged in! We have also implemented a new, more visually appealing way of helping you find the right report from within the Analysis menu. FSP Return (CTF) and Reporting Added! This takes the data you have entered for your Reception cohort in the Summer term and converts this into the format specified by the DfE. At the same time we have introduced a number of useful reporting options to analyse this data within your setting, including summaries by aspect and by vulnerable groups (covering 'Good Level of Development' as defined by the DfE here). As well sorting by name or age stage, in the Results section you can now also sort by a child’s age in months by clicking on the blue field heading. Remember that clicking on the blue underlined column headings in the My Pupils and Results sections sorts the list by that column. Clicking the same column header again reverses the sort order. An important new report has been added to the Tracker which allows you to demonstrate the progress children have made, using the Ofsted definition of expected progress (see paragraph 30 of the Ofsted Subsidiary guidance). For two selected points in time, the report analyses whether children were below, at or above expectation at the start, and below, at or above expectation at the end. By comparing these two assessments, the report shows whether the child has made above expected progress, expected progress or below expected progress, depicted by colour-coded arrows. 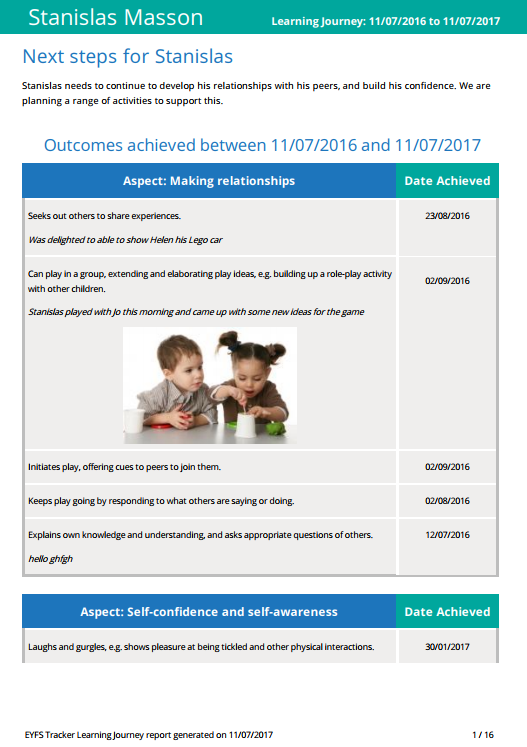 Note that practitioners are encouraged to supplement the analysis with their own judgements of a child’s progress – the report provides space for you to do this. Please get in touch if you have any feedback about this new report or if you have any questions. 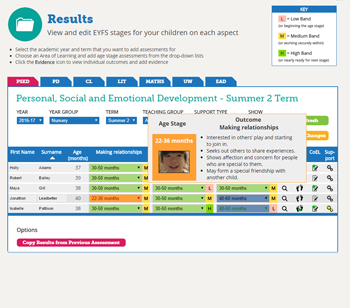 EYFS Pupil Tracker Live for the 2012 Framework! We are pleased to announce that the EYFS Pupil Tracker is now ready for use with the new statutory framework. The look and feel of the system should be very familiar to existing users, except that you now assess a child’s stage of development using the aspects and development matters from the new framework. The 17 aspects of the new framework are arranged over 7 area of learning tabs on the Results page. 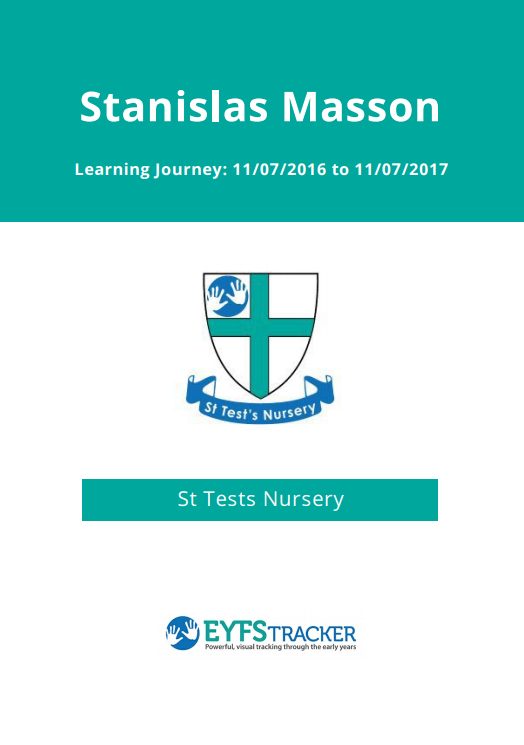 All the other facilities of the EYFS Pupil Tracker remain the same, including running analysis by pupil groups, adding photos and other attachments, producing learning journey booklets, and much more. What’s more, we have converted all your historical results data into the equivalent aspects in the new framework. We hope you enjoy evidencing your children’s progress using the new, simplified EYFS in the EYFS Pupil Tracker!